On February 11, 2019, His Holiness Patriarch Mor Ignatius Aphrem II received His Excellency Hans-Peter Glanzer, Charge d’Affaires of the Austrian Embassy in Damascus, at the Patriarchate headquarters in Bab Touma – Damascus. 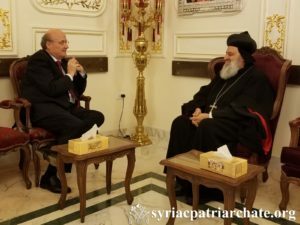 During the meeting, His Holiness discussed with His Excellency the general situations in Syria and Lebanon. They also spoke about His Holiness’s last visit to Austria.